Washington, DC hasn't always exactly been viewed as a cocktail powerhouse -- at least not compared to cities like London, New York, or New Orleans. But that perception is rapidly changing, as multiple styles of quality cocktail bars continue to pop up around the District. More than ever, DC bartenders are utilizing high-quality spirits, squeezing their own juices, and making their own sodas, mixers, infusions, bitters, and garnishes. Now that the city also counts a handful of serious distilleries inside its border, our cocktail scene is propelling forward, providing bartenders with an arsenal of local liquors of which we can all be proud. 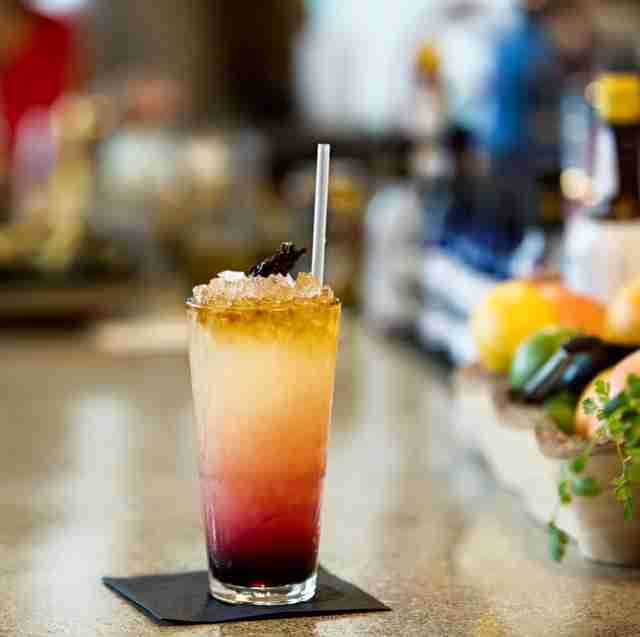 An unfortunate downside to cocktails becoming better, however, is that they're also getting more expensive. Finding a good drink for under $10 is a chore, and paying $14 a cocktail is no longer laughable. Thankfully, though, a number of drinks live up to the price. 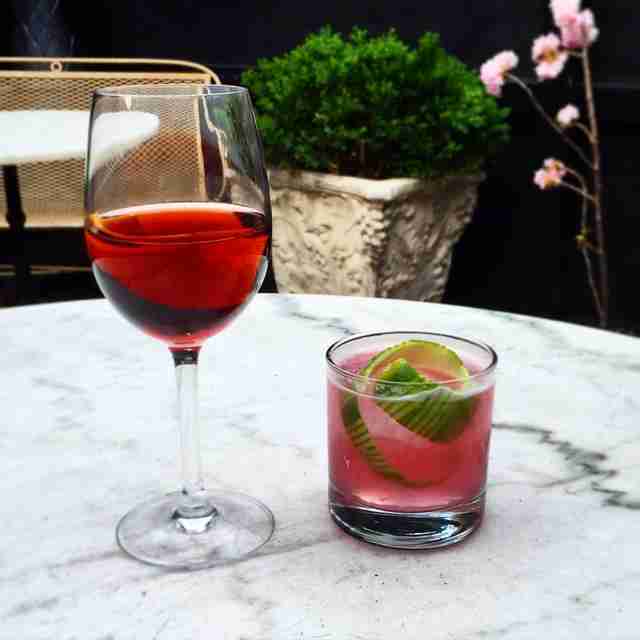 Here are the game-changing, must-visit bars in DC that cocktail enthusiasts need to experience. Chef José Andrés is one of the biggest culinary innovators in the world, and his magic doesn’t stop in the kitchen. 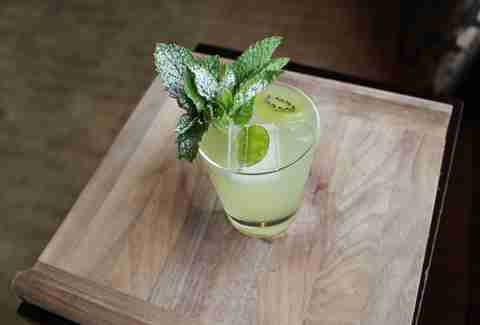 barmini opened in early 2015 as a chic companion to the boundary-bending minibar. It’s not a cheap place to drink, but you’ll feel damn fancy, and it’s a great place for a date or a celebration with friends. Among the lengthy list of cocktails, we especially recommend the Divine Wind, which mixes shochu, orange liqueur, butterfly pea flower, and lime, as well as the dramatic Cedar and Agave which blends tequila anejo, Benedictine, agave, orange bitters, and smoke. The sleek bar also serves some whimsical and tasty tapas, such as a foie gras waffle with peanut butter & honey. The cocktail world is in the midst of a Tiki revival, and while plenty of DC bars mix a fine Tiki drink, Archipelago is the city’s first dedicated Tiki bar. 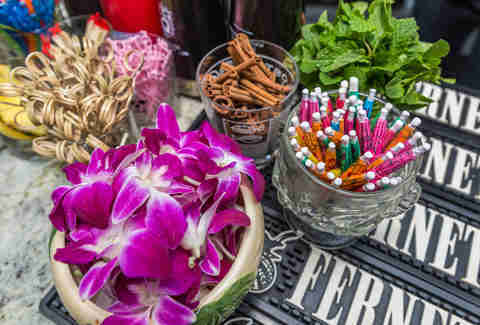 The space, while subdued, is still kitschy enough, with its playful decor, classic Tiki glassware, and snazzy cocktail garnishes (pictured above) adding to the flare. Two of the more popular drinks, the owner says, are the Retired Stripper ($14), made with tequila, rhum agricole, melon cordial, and lime, and the If The Phone Don't Ring, It's Me ($12), which is comprised of bourbon, passion fruit, and Aperol. Archipelago also serves a tasty selection of tropical-tinged food, including ham and cheese sliders on Hawaiian bread, Lion’s Head meatballs, shrimp toast, and a jerk chicken sandwich. 2 Birds 1 Stone may be hidden beneath doi moi off bustling 14th Street, but it’s far from an unknown element in the DC cocktail world. 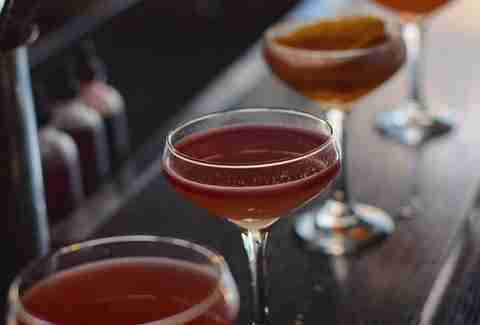 The casual, often crowded bar is known for its original concoctions and reimagined classics, such as its frozen Aperol spritz, thanks to award-winning bar director Adam Bernbach (Proof, Estadio, doi moi). The hand-drawn menu changes weekly, but some favorites can be made even when they’re off-menu, including the excellent Koopa Beach, made with mezcal, Chartreuse, and house ginger beer. Cocktails usually fall between $12 and $14, and the menu typically features a bartender’s choice punch for $10. Bar Charley excels in variations on cocktail classics. The bar’s big draw is its selection of fifteen Manhattans and variations thereof, including options like the Boulevardier (whiskey, vermouth, amaro) and the Suburban, which uses rye whiskey, dark rum, and tawny port. The value is outstanding, too: many of the bar’s drinks cost $10 or less, including the rotating draft Tiki cocktails for under $8. The dinner menu doesn’t make the bar a destination in itself, though a plate of Catalan fries (chimichurri, romesco, cheese, fried egg) or the big board (charcuterie, cheeses, and olives) make for solid drink companions. Black Jack’s casual bar atmosphere might not scream craft cocktails, but this place offers super-fun New Orleans vibes and classic American cocktail culture. 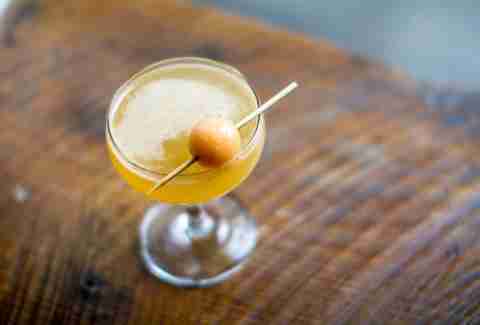 House cocktails are a relative value at $12, and stick out for their approachability and balance. There’s nothing overly fancy happening here, but you don't always need to overthink it. The Blue Vein mixes vodka, Black Jack cassis, lemon, lime, and ginger beer, and the popular Maple Derby is comprised of bourbon, maple ginger syrup, grapefruit juice, and lemon. Black Jack also slings a menu of classic cocktails for $10, including drinks like daiquiris and Sazeracs. The restaurant is a member of the Black Restaurant Group, so the seafood here is also on point, especially the raw oysters and steamed mussels. This bar feels swanky as all get out. The majestic dining room overlooks the Potomac River, and the bar is on fire, cranking out cocktail perfection for bigwig hotel guests and bar patrons alike. Torrence Swain is a wiz behind the bar, and his extensive menu remains rooted in the standards, while taking advantage of high-quality spirits and ingredients to create some new twists. The house standard Potomac cocktail is a play on the dirty martini, incorporating house-made white truffle brine. The rest of the selections change seasonally, such as the Koala in Cuzco, made with mint-infused pisco, kiwi, and fresh lime. Bonus: this joint also offers up a cigar menu, and the atmosphere to match. After being forced out of its original location in early 2015, the Columbia Room found new life when it reopened in Blagden Alley just over a year later. Owner Derek Brown is one of the premier leaders of the DC cocktail scene, and a founding member of the city’s Craft Bartenders Guild. The bar’s primary appeal is its seasonally changing tasting menu, a ticketed $75 three-cocktail experience paired with light bites. There are also several indulgent menu supplements available, such as a $25 two-course upgrade. Those who prefer to roll without reservations can snag a drink in the indoor "spirits library," or in the outdoor punch garden. The à la carte drinks range from $12 to $17 each. This Asian dumpling and cocktail bar has one of the most extensive cocktail lists in the entire city, ranging from classics to tropical inspirations. It can all be a bit intimidating if you don’t know what you’re looking for, but we recommend that you focus in on Copycat’s unique bitter spirits and drinks. We’re talking everything from a straight shot of Angostura bitters(!) to the less-bitter Siesta comprised of lime, Campari, grapefruit, and tequila. The food choices include a variety of delicious potstickers, skewers, and steamed bao. When Dram & Grain opened beneath sister bar Jack Rose (a world-class whiskey bar that also serves top-notch cocktails) in 2014, it operated as a relatively low-key speakeasy. That didn’t last long, as word quickly spread about the bar’s high-quality, creative cocktails and its jovial and hospitable staff. 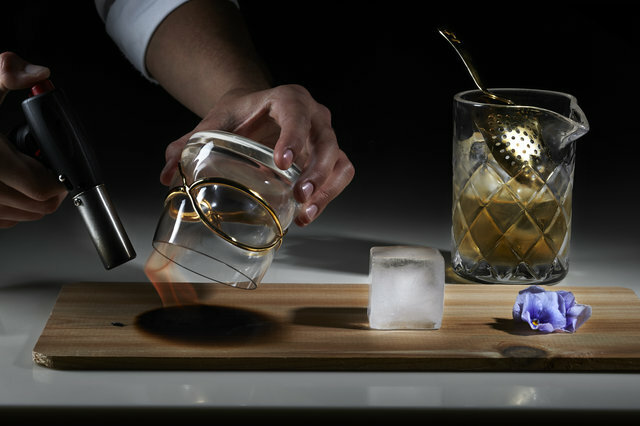 One cog of the small team is Lukas B. Smith, one of the most talented bartenders in the whole city, who pushes boundaries with his ingredients and techniques. The entire Dram & Grain staff relishes the details of the cocktail process and makes as many of its own ingredients as possible, from sodas and mixers to orgeat and syrups. The menu can be daunting, with more than 30 choices, but they’re always happy to walk guests through the menu or mix up an old favorite -- there’s no pretension happening here. Reservations are required for Friday and Saturday night, and the bar is first-come first-served Tuesday through Thursday. If you get hungry during your visit, order up some Southern snacks, like deviled eggs or pimento cheese dip. We've Got That Good Gin, Now Where's the DC Whiskey? The word "speakeasy" gets thrown around a lot these days, but it’s a pretty apt description in this case (except for, you know, the legality element). Guests enter through The Gibson’s unmarked door off 14th Street. The Gibson opened in 2008, and is one of the steady trailblazers of the District’s modern cocktail boom. Bartenders here are masters of classic cocktails, but you can't go wrong just ordering an Old Fashioned. The drink list hovers in the $10-$15 range, and is organized by type of spirit, making it easy to find something you’ll like. There are always seasonal choices as well, like the Feeling Good But a Little Strange, which blends gin, honey, grapefruit, ginger liqueur, and brandy. Be sure to grab some of the snacks, like mixed nuts and olives, too. It’s tough to get much cozier than Left Door: the bar space was formerly a one-bedroom apartment. It’s now a Victorian-inspired cocktail lounge, complete with antique chandeliers and green velvet chairs. In addition to the standards, consider ordering the W.T.F. 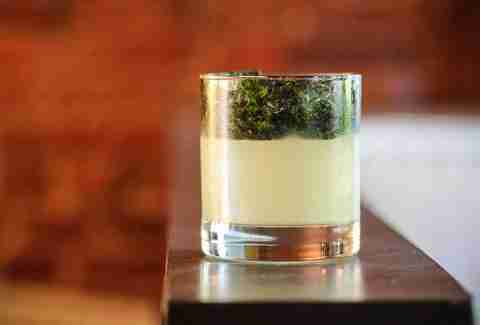 ($14), made with London dry gin, strawberry-infused Dolin Blanc, and fruit caviar. Or go with the exotic Fujiyama Mama ($15), mixed with shochu lemongrass, fresh lemon juice, ginger syrup, coconut milk, allspice, and soda. Room 11 is one of the city’s best neighborhood spots for a cocktail. The small restaurant and cafe has a bit of a District hipster vibe (we mean this in the best way possible), and a great patio overlooking 11th St. It’s the perfect spot to impress a date or out-of-towner, or to just unwind with a cocktail on a warm summer evening. The drink menu is short and thoughtful (usually four or five choices) and rotates regularly. One of the summer favorites is the Parapluie de Pamplemousse, French for "grapefruit umbrella." It’s a blend of cognac, pink grapefruit liqueur, Campari, lemon, and Bitterman's hopped grapefruit bitters. Room 11 also serves a thoughtful and revolving menu, with everything from house-made pasta to fresh seafood and grilled cheese sandwiches. Some cocktail bars in DC focus on pre-Prohibition and Civil War-era cocktails, but Round Robin Bar doesn’t have to pretend -- it’s been in operation since 1850. It may not be the buzziest spot in town (and drinks are pricey, at $15 each), but it’s tough to compete with the old-school feel of sipping a mint julep surrounded by decades of political history. The bar’s age hasn’t stagnated innovation, either: the cocktail list has plenty of nods to current trends, such as the sake gimlet and the Mezcalini, a drink mixed with mezcal anejo, Green Hat gin, Luxardo, and fresh lemon. If you get hungry, turn to bar fare like the Asian-style teriyaki cheese steak or rich mac & cheese balls. Royal opened in June 2015 and has quickly carved out a niche as a neighborhood hangout in LeDroit Park. This cozy cafe offers everything from coffee to arepas -- not to mention a killer cocktail program. Bar manager Lee Carrell and his staff are well-versed in classic cocktails, including a G&T ($10) made with house-made tonic, and a caipirinha that pairs well with the kitchen’s burger or grilled steak. The speciality cocktails feature many hits, such as the Alvarez ($13) -- a blend of mezcal, maraschino, vermouth, and bitters. This place is also big enough that you can actually hear your companion talk, so it's a great option for date night. Travis Mitchell is a freelance writer for Thrillist Food & Drink who has been sipping on DC's best cocktails since 2010. Follow @travisjmitchell on Twitter and Instagram.